Markus Lundl might look a little goofy, but he is Swedish, so give him a break. Granted, he is far from faultless, but for one young French widow that is rather the point. She had perfection and now it is time to move on. She will deal with her bereavement and unlikely rebound in David and Stéphane Foenkinos’ Delicacy, adapted from the former filmmaker-brother’s novel, which opens this Wednesday in New York (trailer here). While Delicacy spends a fair amount of time with Kerr’s initial happiness and subsequent mourning period, it really starts to click when Lundl enters the picture. As her unexpected love interest, Belgian born François Damiens looks Swedish enough and projects the perfect sad clown aura. Though Audrey Tautou largely gives her sprightly Amelie persona the deep freeze, she plays off Damiens quite well. Yes, we have been down this road before. Indeed, the Foenkinos brothers freely mix elements of the goony guy wish fulfillment fable with a female recovery story worthy of the Lifetime network. Yet, they give it an eccentric charm and the occasional mad flourish to keep more discriminating viewers hooked. 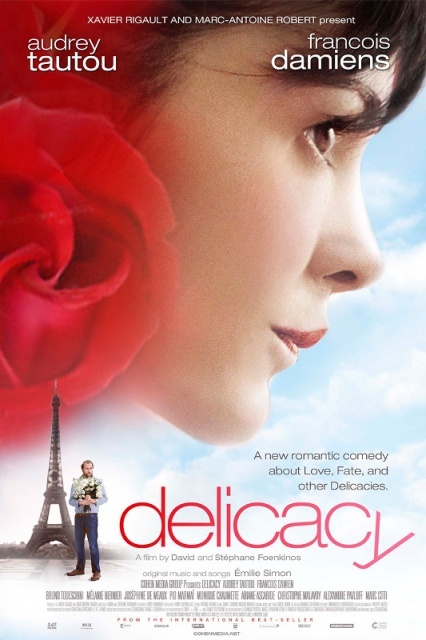 Delicacy has nice chemistry, which counts for a lot with this sort of film. The Brothers Foenkinos are also somewhat more willing to plum their characters’ dark angsty places, helping differentiate the film from the rom-com pack (making it more of a truffle than a bonbon). Still, it remains haunted by inevitable comparisons to Tautou’s thematically related prior films. Ultimately, it is quite a pleasant if not essential viewing experience. Recommended for Francophiles and unqualified romantics, it opens this Wednesday (3/14) in New York, uptown at the Elinor Bunin Munroe Film Center and downtown at the Landmark Sunshine.